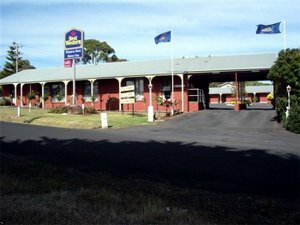 The Best Western Whalers Rest Motor Inn is located in a quiet rural setting 4 kilometers north of he post office. We offer 4 Star accommodations with all rooms located on the ground floor. Come and enjoy the scenic beaches, rugged coastlines, shipwrecks, seal colony, petrified forests, geothermal energy pools, arts and crafts, wineries, horse riding, scuba diving, fishing, canoeing, national parks and many more. Portland is situated on the western gateway to the great ocean road. Experience heritage buildings and Victoria's history, being the first settlement, an old whaling town. Whales still visit Portland from May to October yearly. * 1 kilometer(s) from fishing, boat hire and tours available * 4 kilometer(s) from Shelley Beaches, surf waves, sand dunes * 4 kilometer(s) from horse riding lessons, beach rides, horse camping, safaris, trail rides * 4 kilometer(s) from Victoria's first settlement, historic buildings * 5 kilometer(s) from Ports only privatized port in Australia, deepest between Melbourne and Adelaide. * 5 kilometer(s) from shipwreck tours and scuba diving organized by divers * 6 kilometer(s) from Botanical Gardens, has heritage listed plants * 7 kilometer(s) from geothermal energy, geothermal energy used in town buildings, pools * 10 kilometer(s) from National Parks, visit volcanic craters, wild flowers and wildlife animals. * 10 kilometer(s) from canoes, available for hire down Glenelg River * 17 kilometer(s) from Seal Colony, 1-hour return walk and boat ride out to seal colony, 200-300 seals.